Corn Roast Festival 2009. Photo by H. M. Kerr-Schlaefer, all rights reserved. The Corn Roast Festival is held annually in Loveland, Colorado and is the community’s oldest festival. The event takes place at Fairgrounds Park, the historic site of the Larimer County Fair, now located at The Ranch. The park, just south downtown, is beautifully maintained and bordered by the Little Thompson River. This is one of the Mayor’s favorite festivals because it is truly a small slice”¦er”¦kernel of Americana. Americans like corn; it’s in almost everything we eat, but our favorite way to eat corn is to roast it and drench it in butter. If this is your idea of good eats, this is the festival for you. The first Corn Roast Festival was celebrated in the late 1800s, but was revived in 1982 as a community event. Today it’s a two-day festival featuring a parade, bands, dancing, rubber duck races, beer, and of course, every kind of corny contest you can imagine. There is a corn eating contest, a corn recipe contest, and the crowd favorite, a corn-shucking contest. 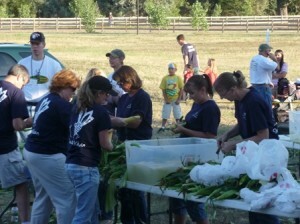 A hard-working team of corn shuckers at Corn Roast Festival 2009. Photo by H.M. Kerr-Schlaefer, all rights reserved. The corn-shucking contest involves 35 teams from around the area, some representing local businesses and organizations. Each team consists of seven shuckers who will be judged on the number of ears shucked, cleaned, washed and bagged in three minutes. The event includes prizes for 1st, 2nd and 3rd place, and new this year is a prize for best team t-shirt. The first place team also receives a highly coveted permanent plaque at the Loveland Chamber of Commerce. Corn shucking teams mean business and this is an event not to be missed. It involves all the anticipation, excitement and tension of a professional sporting event. The corn shucking competition starts at 5:30 p.m. on Friday, August 24, 2012. This event draws a crowd, so get there early to cheer on the shuckers. The festival starts on Friday at 5 p.m. and runs through Saturday, August 25. Saturday’s festivities starts with a parade through Downtown Loveland at 9:30 a.m.. The rest of the day is filled with cornball fun. Festivalgoers eat through approximately 15,000 ears of the delicious sweet corn on the cob. The corn is roasted then dipped in butter and salted to taste. It’s definitely worth getting a few kernels stuck in your teeth. There’s lots of other food too, but don’t miss out on the corn. 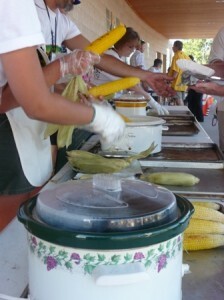 Loveland’s Old Fashion Corn Roast Festival runs August 24-25, 2012. Fairgrounds Park is located at 700 South Railroad Avenue in Loveland. For a schedule of all the events and bands, click here. Find the festival on Facebook here! 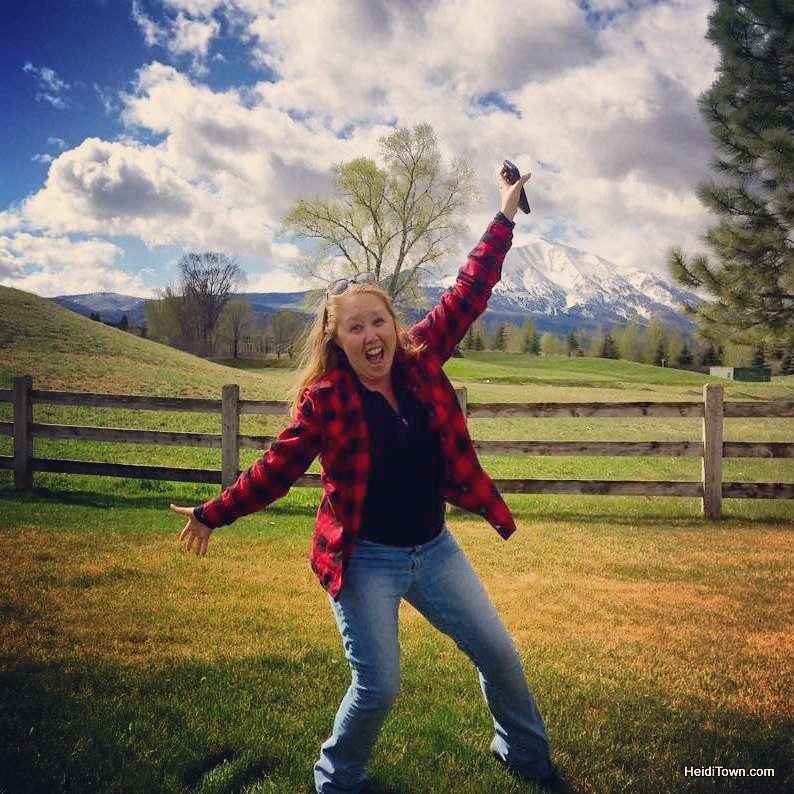 Thanks for posting such good photos! This year I entered the recipe contest – a first for me – but I wanted to participate in every way I can. What a blast! Can’t wait for the parade tomorrow and … Balloon Glow in the evening!